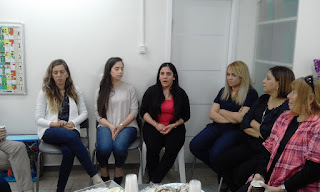 We started the day with a visit to Jewish elementary school in Haifa, where our grantee Merchavim has placed several teachers of Arab Israeli background. There is a surplus of Arab Israeli women trained as teachers, and a shortage of English, math, and science teachers in Jewish schools. The teachers we met, above, said they felt welcomed and at home at the Jewish school.